Are religious colleges getting more religious? A potentially interesting trend to look at is the religious participation of students attending Catholic or other religious institutions. I wonder if the trend is toward religious students (those who report both religious affiliation and participation in students) being more likely to go to religiously-affiliated colleges. This would mean a reduction of religious students at state/non-sectarian schools and an increase in the religiosity of students at affiliated schools (this might even be skewed because the survey doesn't include some of the most religious schools such as Liberty University). This would be a reflection of the increasing polarization of our society. On another subject, I tend to distrust steadily increasing social trends. From a complexity theory perspective, I would expect more of a cycle in religious (dis-)belief, so I wouldn't be surprised to see a crash in the number of non-believers sometime in the near future, although predicting exactly when that will happen is virtually impossible with the relatively small amount of data available (40 years is not enough). There are several interesting questions here. 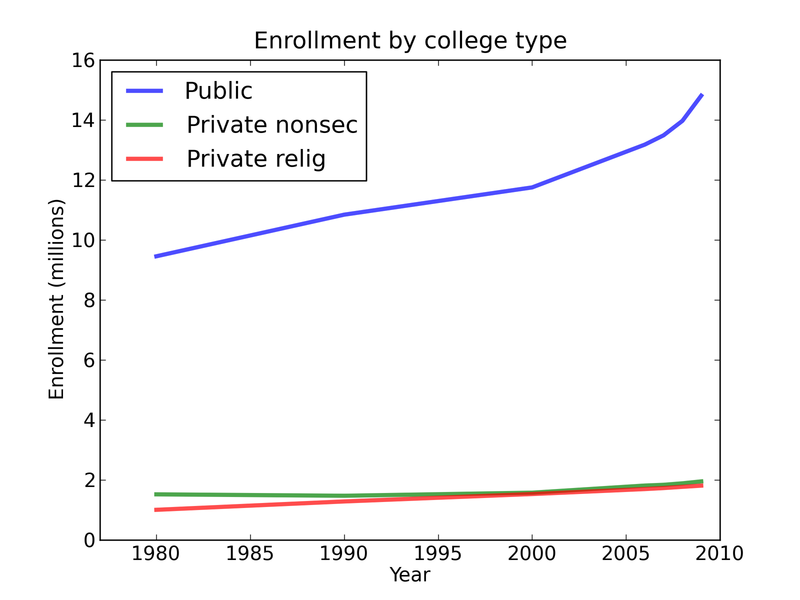 The first is whether religious colleges are getting more religious. This one is relatively easy to investigate: the HERI survey provides data broken down by several types of colleges, including Nonsectarian, Catholic, and Other Religious Affiliation. The percentage of Nones is increasing in all categories, more slowly at religious colleges than at other private colleges. Nevertheless, the fraction of students at religious colleges with no religious preference has nearly tripled in the last 35 years. Clearly the trend is slower; in fact, it is not obvious that it is statistically significant. 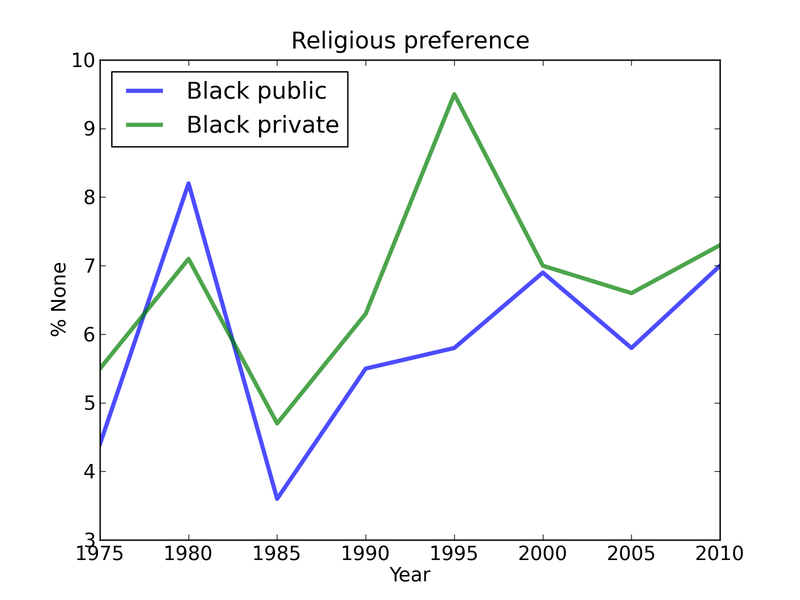 And since about 1990, the percentage of Nones is higher at religious colleges than at HBCUs, by more than a factor of two (13%, compared with 7%). 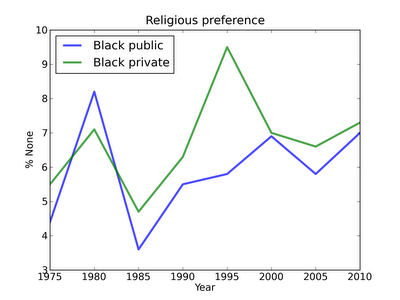 Getting back to the reader's question, it doesn't look like the religious schools are getting more religious. 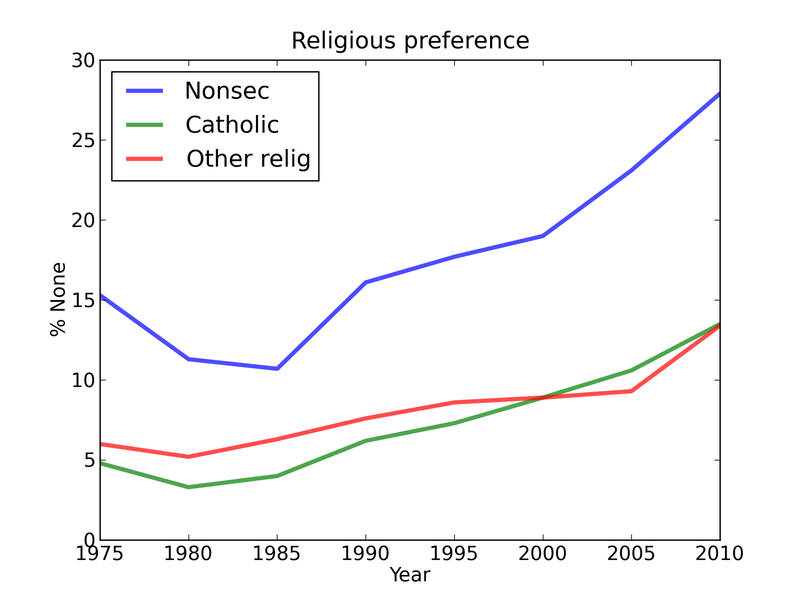 In fact, they are getting less religious at almost the same rate as other schools. But maybe the fraction of students going to religious colleges is increasing? Here is a table from the National Center For Educational Statistics, which publishes the Digest of Education Statistics. It shows "Fall enrollment and number of degree-granting institutions, by control and affiliation of institution: Selected years, 1980 through 2009." 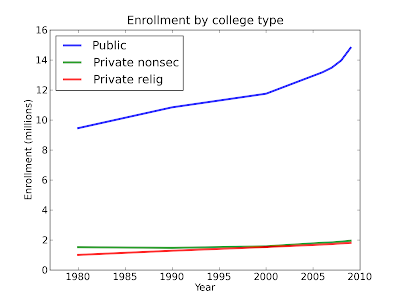 Before 1995, religious colleges were gaining market share, at the expense of nonsectarian colleges; other than that, there is not much going on. Are religious students more likely to attend religious schools? Maybe. It's hard to tell with the data I have. Are more students going to religious schools? Not lately. 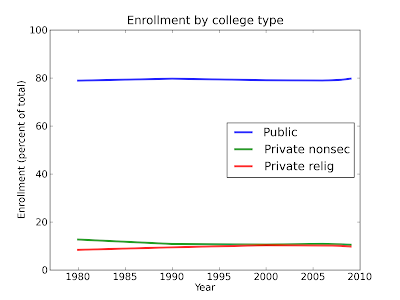 Since 1995, the fraction of students at religious colleges has been flat. Are students at religious schools increasingly religious? No. The percentage of Nones has increased in all college types, including religious colleges. Do these trends introduce a bias in the results I presented? Not that I can see. As for distrusting steadily increasing social trends, I agree that some caution is needed. 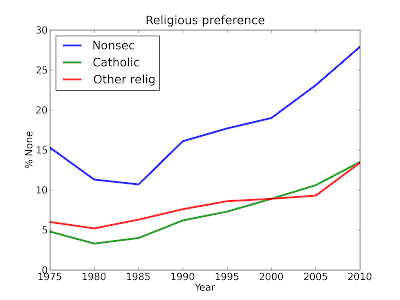 The percentage of Nones can't keep accelerating forever. But it can keep growing forever. Steven Pinker presents several one-way trends in his new book, The Better Angels of Our Nature. And Peter Singer, who reviewed Pinker's book in the New York Times, discussed related ideas in The Expanding Circle. But who knows? I guess we'll see what next year's data point looks like. Many thanks to the reader who posted the comments that prompted this update. Here is my original article from March 2011. Here is the update from January 2012.